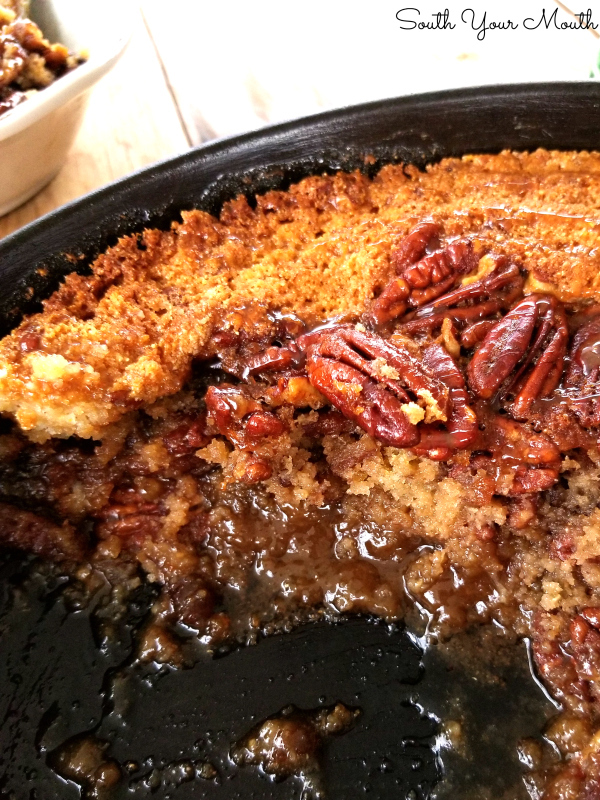 The last time I was in Texas I was introduced to something I’d never heard of or tried before: pecan cobbler. It was obviously a local favorite and one bite made it a favorite for me too! I also had some of the best fried catfish I'd ever eaten in my LIFE but was stunned to hear no one knew what Catfish Stew was?? 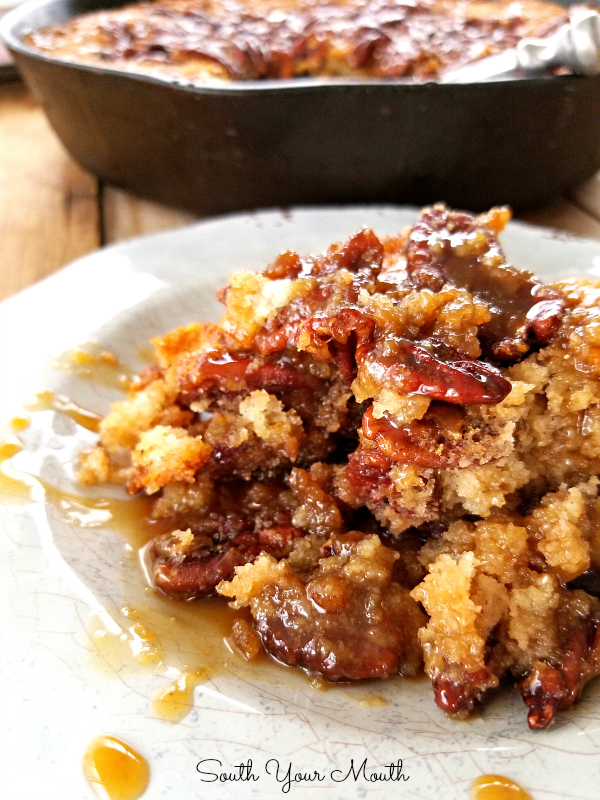 I’ve searched a bit online over the years for a similar recipe but have never been able to find anything like the pecan cobbler I had tried on my trip. A few weekends ago I decided I was going to figure this thing out so I stocked up on the essentials and decided I wasn’t leaving home until I had it right. I might have also swiped a bag of pecans and a bottle of corn syrup from mama’s house too. Pecans recipe experiments can get expensive! I had jotted out a few notes and kinda knew which direction I was going with things. I fired up the oven and started assembling everything. I got my pecan filling ready then went to make my dough and realized I was OUT of flour. Like, slap out. Like, not even a piece of a bag shoved in the door of the freezer out. No all-purpose flour. No self-rising flour. No nothing. But you know what I did have? Why, oh why, oh why have I never thought of this before?! 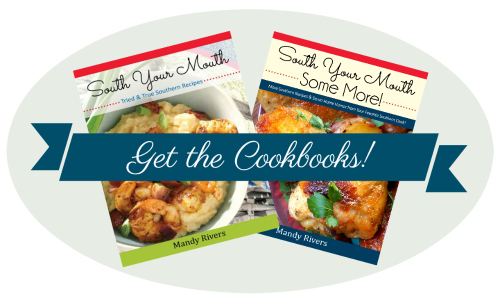 I mean, I’m in the heart of Dixie, baby, cornbread cobbler should be a thing! It shoulda been done been a thing. 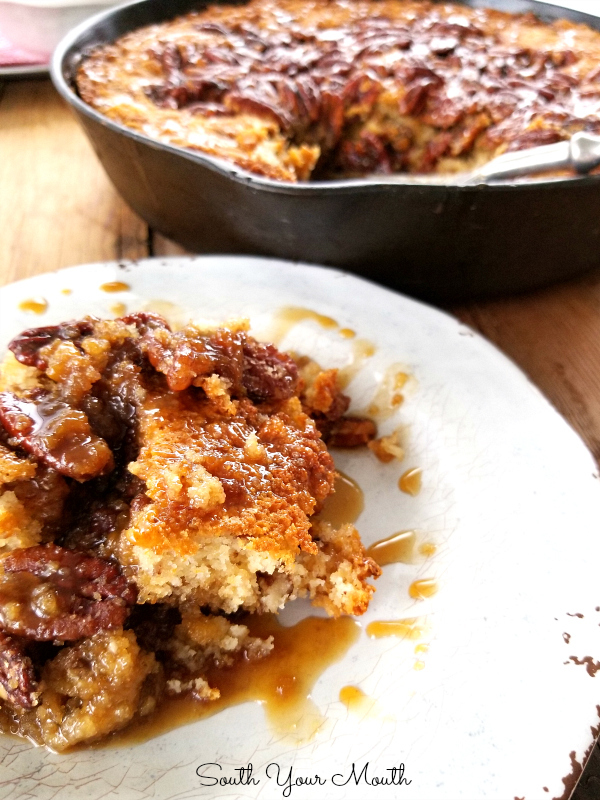 So, I whipped up some pretty basic cornbread batter, poured it into a piping hot skillet sizzling with melted bacon grease and hoped for the best. This was going to be a total crap shoot. I didn’t have any idea if my pecan filling recipe was going to work and I dang sure didn’t know if my cornbread cobbler idea was going to work but I decided to go for it. And it was amazing. It was rustic and country and tasted like something I should be eating off of a tin plate. Now, I should tell you, because this recipe is made with a basic cornbread recipe, it’s very “grainy” because of all of the cornmeal. Which is what I was after. But if you like sweeter, “cake-like” cornbread, feel free to use your own recipe (or use 3/4 cup SR flour and 1 1/4 cup SR cornmeal then add sugar if desired). I think you could also use a box mix too if you want to make things easier! Another thing I noticed is that this was a bazillion times better when it was still piping hot, fresh out of the oven than it was later in the day. After it sat a while, the cornbread soaked up all the filling. It was still great but this is definitely something you’re going to enjoy best when it’s hot out of the oven. Place a 2-quart 15-inch cast iron skillet or metal 2-quart baking dish in the oven then preheat to 375 degrees. You can also use a or 2-quart glass baking dish but DON’T preheat the dish or it could break if left to heat too long. Combine corn syrup, brown sugar, eggs, vanilla, melted butter and salt in a mixing bowl then stir until all ingredients are thoroughly incorporated. Set aside. Remove skillet from oven then add enough vegetable oil or bacon grease to coat the bottom and sides of the skillet. Swirl oil or grease over the insides of the skillet. Return skillet to oven. 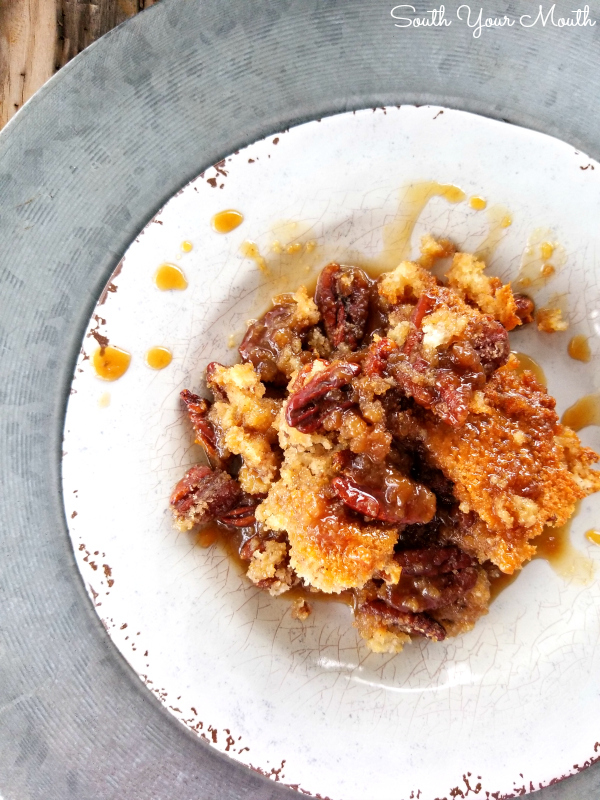 Combine egg, melted butter, cornmeal and pecans in a bowl then mix until just combined. Remove hot skillet from oven then immediately pour batter into hot skillet. Spread batter evenly over the bottom of the skillet. Pour pecan filling over cornbread mixture then cook at 375 degrees for 30-40 minutes or until center is mostly set (some jiggle is OK). Place aluminum foil over cobbler the last 10 minutes of baking if necessary to keep the cornbread from browning too much. Serve immediately (while hot!). Serve as-is or with ice cream or whipped cream. See notes in the last two paragraphs above the recipe about texture, variations and serving this HOT. I saw the picture and thought "Oh my, that looks wonderful" and then read the title... Nope, nuh uh, not doing sweet cornbread. Can't handle it. Sweet Husband on the other hand would be thrilled, lol. 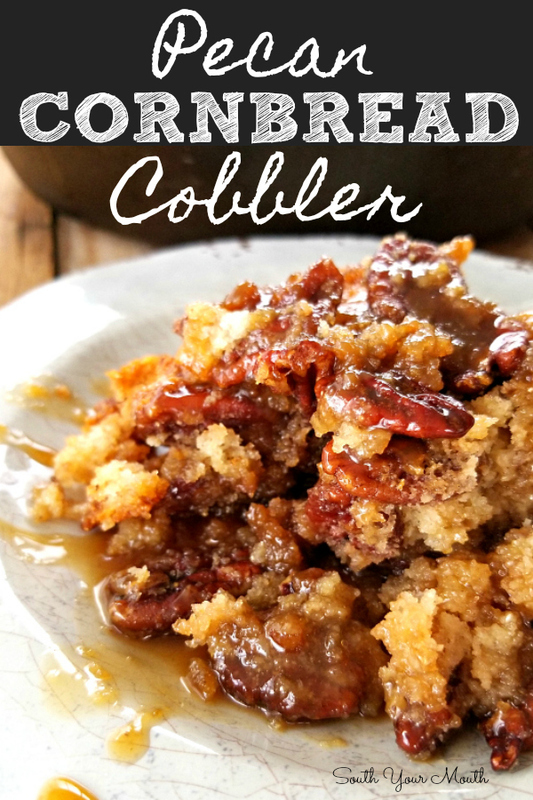 If I wanted to make a regular pecan cobbler, would I just substitute the same amount of SR flour for the cornmeal? I *think* that would work but since I haven't done it myself, I hesitate to tell you for sure. If you decide to try it, let us know how it turns out! This dessert looks amazing to the point that I am tempted to lick the screen. But there is a problem. Here in Ontario, Canada, pecans cost over $40.00 per pound. I wonder, when you share such delicious recipes, if you could do a little extra research, and offer not only a workable substitution, but one that you know to be inexpensive continent-wide. I understand that this would be more work, but it would at the same time make your recipes and your blog more widely appealing, and therefor more widely read. And I have no doubt that you have enough culinary talent to suggest more affordable ingredients for any recipe. Thank you for the courtesy of your time and attention. 1] Substitute a more accessible regional nut, chopped in large chunks if needed. 2] Find a site (there's got to be a bunch) from which to order much-less-expensive pecans. 3] Make a friend/connection in the southern US. how much would you sell your pecans for? Wow! This dies look amazing. Going to try tonight. Thanks. Also am enjoying your cookbook. Hi Mandy! Let me tell you what! This is amazing! 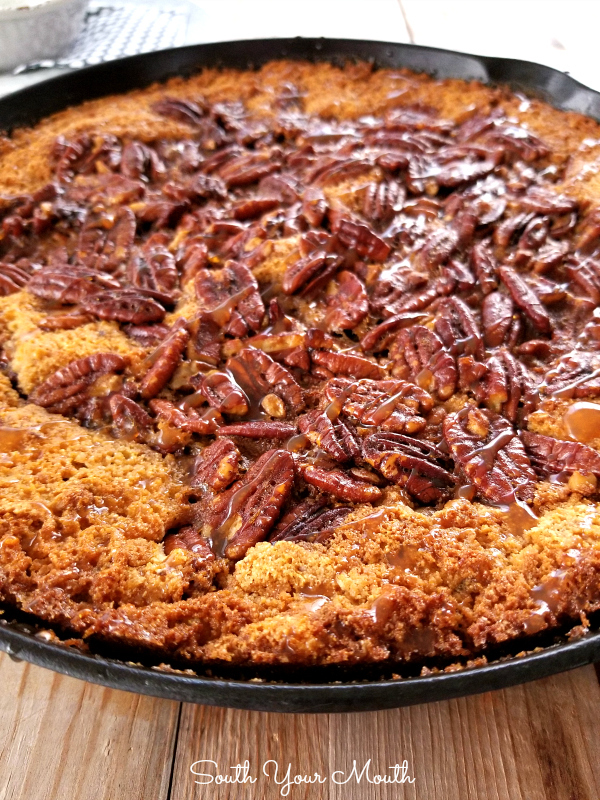 It's like a pecan pie crashed into a skillet of cornbread! It's like the best of two worlds have collided! Thanks for publishing it! My family is very grateful! I am SO happy you enjoyed it!! Once again you have brought back memories. My grandmother made left over cornbread & syrup for a bedtime snack, when I was a child. ( as I am a grandmother now, this was very long ago) Your cobbler looks so good, I can almost taste it. Love your site. Mandy...any thoughts on making this at high altitudes? I’m introducing southern comfort food to friends in Colorado. I really don't have any idea! I guess I'd apply whichever adjustments you typically make for making a cobbler. I hope it works out for you! I'm wondering if a jiffy cornbread box mix would work ? I think it would! I would probably use 1 1/2 boxes (1 might not be enough).